By blocking ransomware at the email gateway, you are preventing it from ever reaching your users. In just a short, 30- day snapshot (April ~ May 2016), Trend Micro Hosted Email Security blocked more than 1.4 million emails with ransomware. Email is mission-critical to your organisation. Email security should be mission-critical too. Cloud-based security is only as good as the infrastructure behind it. Trend stands by the availability of their robust, fully redundant, geographically distributed data centers. If one data center becomes unavailable, emails are automatically and transparently re-routed to a different data center, with no impact on delivery. That's why—unlike other vendors—Trend measures downtime in minutes, not hours. Trend Micro Hosted Email Security helps you fight spam and other threats by applying multilayered email scanning technologies powered by the Trend Micro Smart Protection Network. The Smart Protection Network scans, correlates and filters more than 16 billion website URLs, email sources, and files daily to stop emerging threats in real-time and to continuously improve protection against existing known threats. 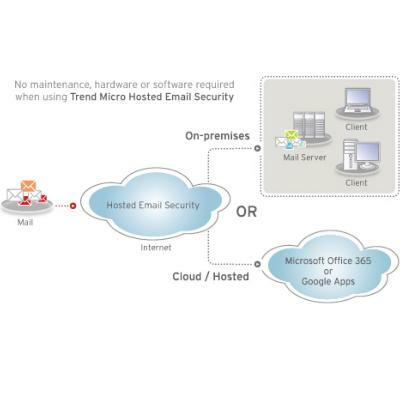 Trend Micro Hosted Email Security deploys rapidly with a simple redirect of the MX record. It simplifies management with end-user quarantine management and flexible policy creation. And you're assured up-to-the-minute security with updates implemented 24x7 by Trend Micro security experts. This site is owned and managed by Open Seas (UK) Ltd with Paragon content recreated with the express authorisation of Trend Micro United Kingdom & Ireland. Open Seas are an official trend Micro reseller partner in the UK.